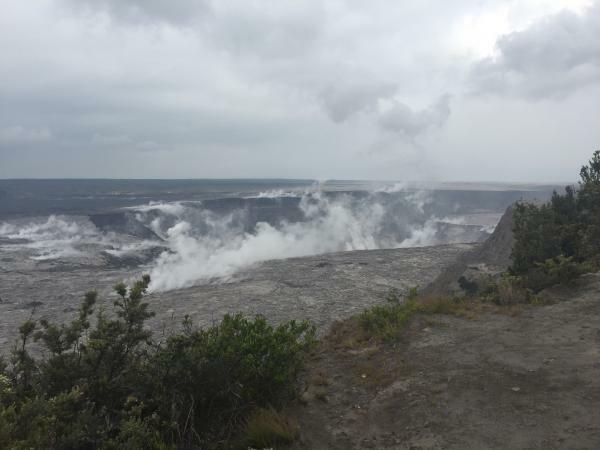 The most recent summit collapse event occurred at 2:55am HST, July 8, with an energy release of M5.4. The Lower East Rift Zone eruption continues pretty much as usual: Fissure 8 feeding a lava river with occasional short-lived overflows. The main lava channel no longer reaches the ocean, but crusts over a half mile from shore and dives into the lava delta, oozing out at multiple points on the northern side. 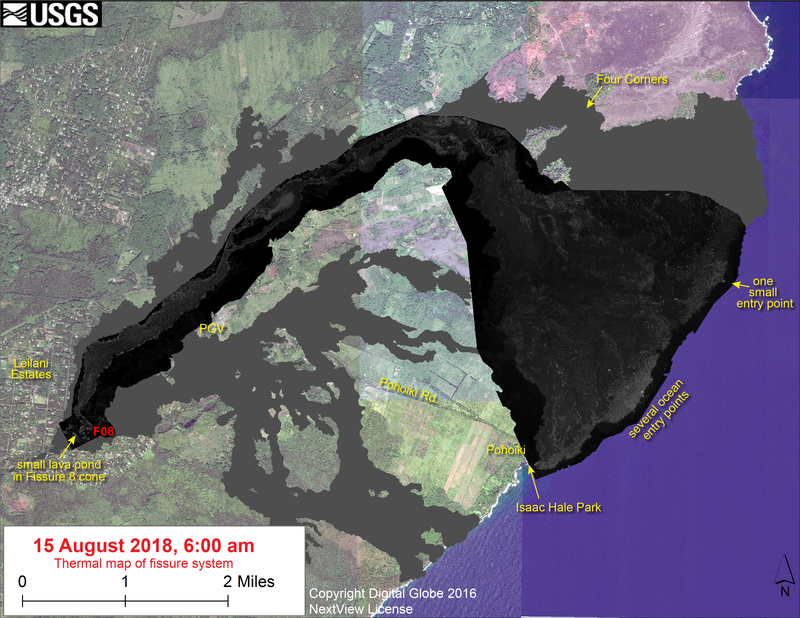 One especially large “ooze-out” makes a short flow on the north side of the flow field near the last few Kapoho Beach Lot Houses, a few of which are hanging on. 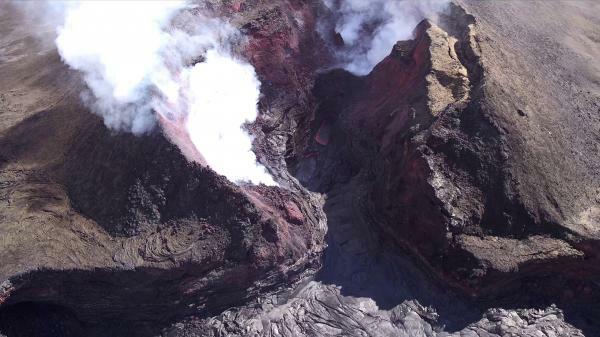 Fissure 22 is weakly spattering with a weak flow to its east. 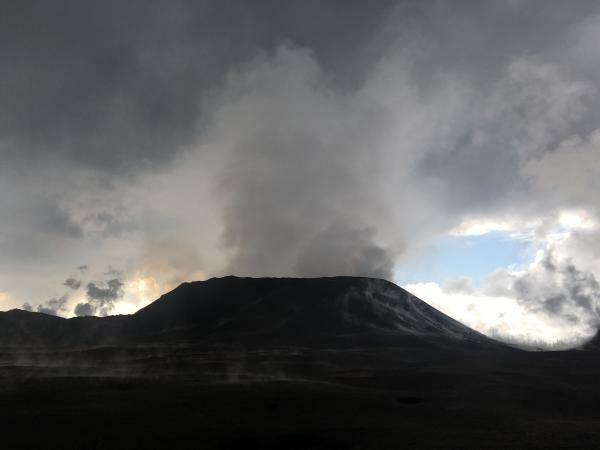 Today’s summit explosion occurred at 6:04pm, equivalent of M5.3. Thick fog obscured the livestream view. 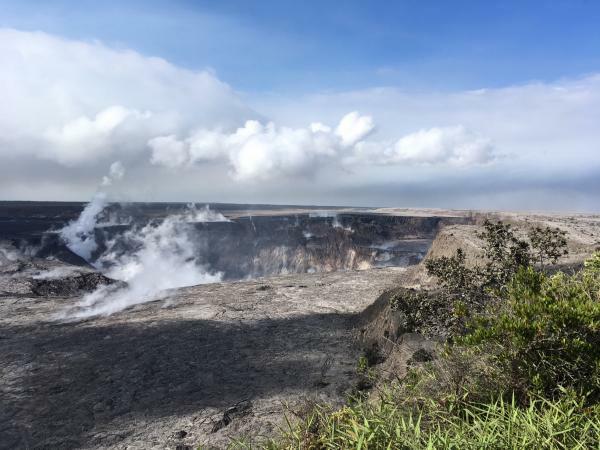 Preceding this meeting was a long-expected document from USGS: Volcanic Hazard at the Summit of Kīlauea Update. 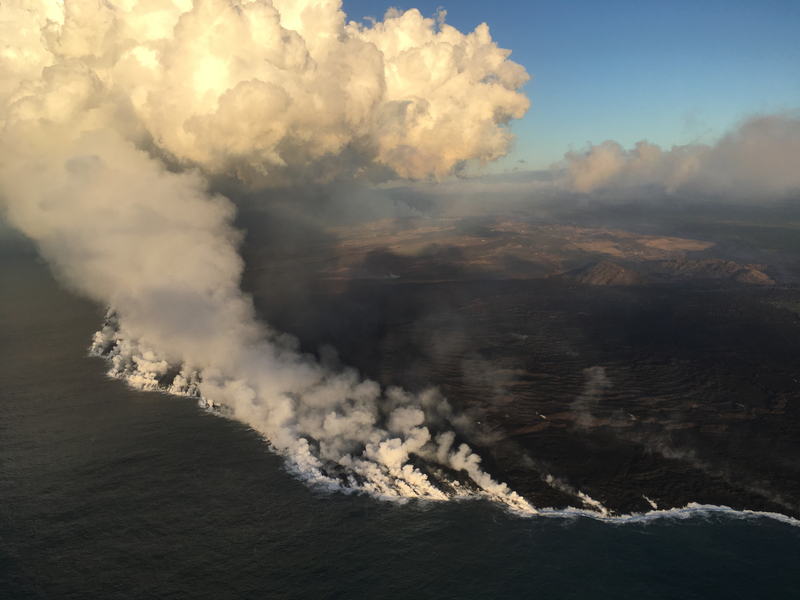 While the Kīlauea Summit Earthquakes FAQ explained what is happening, this new update to a May 8th report summarizes what the USGS thinks might happen at the summit before this sequence is over, based on the volcano’s distant past. 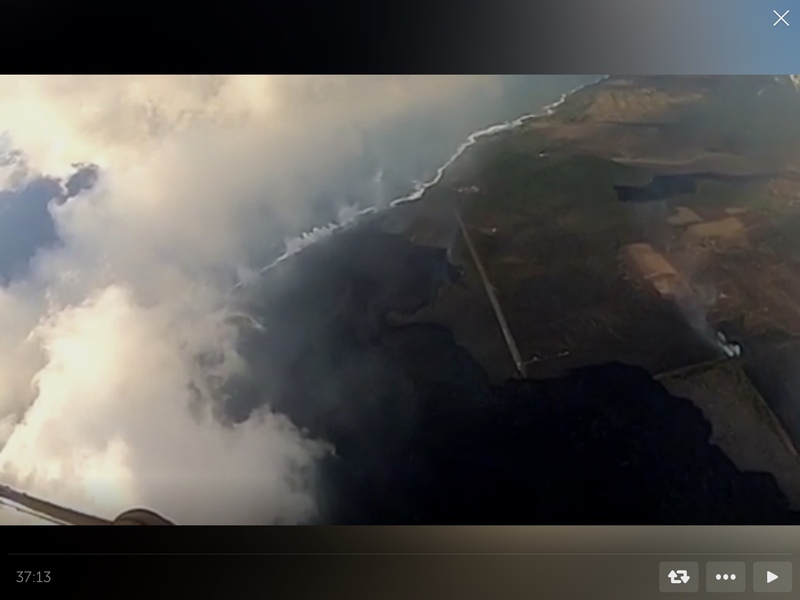 `Hawaii 24/7 puts out weekly timelapse videos collecting all the screencaps from the USGS/HVO webcams. 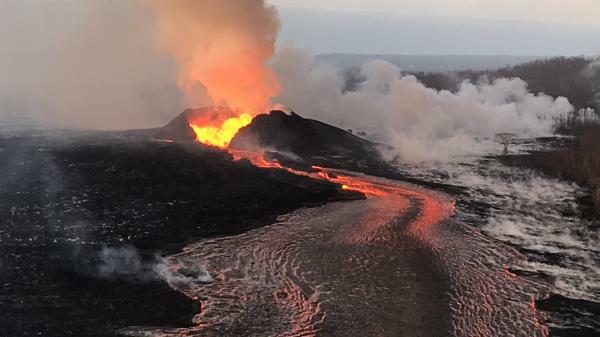 I almost feel like the recent code downgrades for Kilauea and Mauna Loa were a tacit rebuttal of the scaremongers trying to conjure an island-wide catastrophe out of hot air. But I suppose I’m being as irrational as they are. There were specific numbers and criteria for both these status changes. Down at the LERZ, status quo continues. 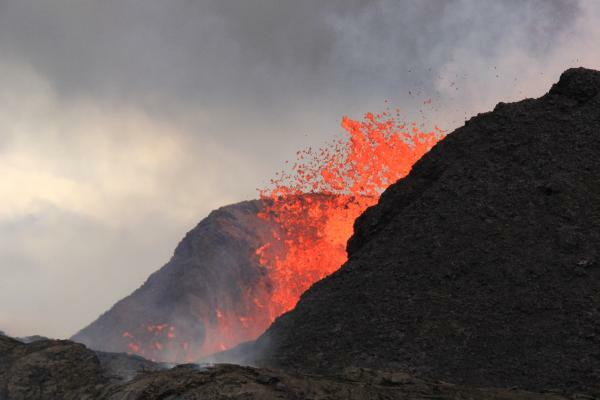 Fissure 8’s lava fountains are vigorous but seldom peep over the cone they’ve built (now 180′). 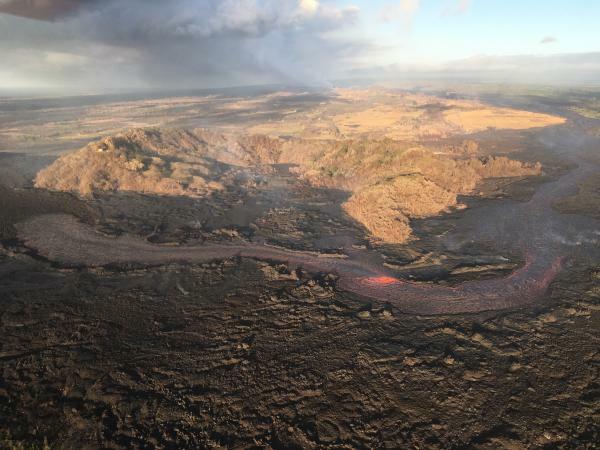 Minor overflows spill out near the head of the lava river without going far. 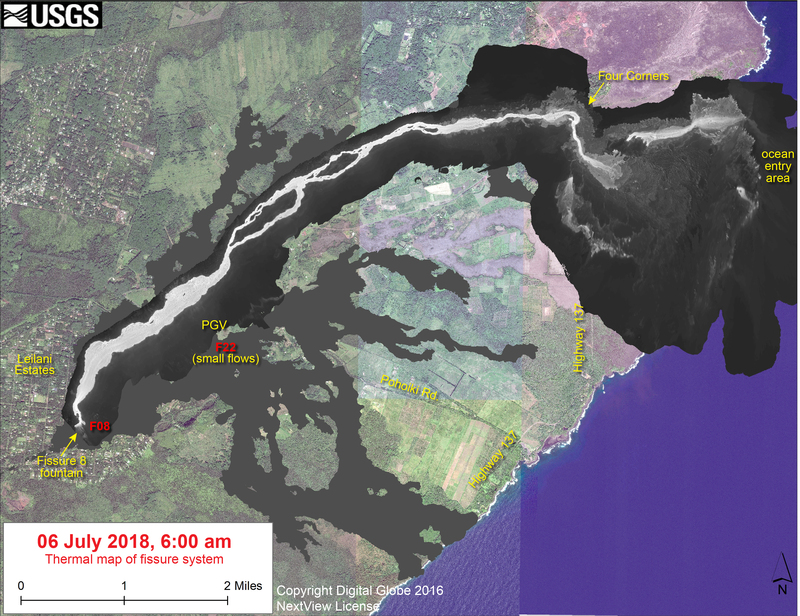 The ocean entry is concentrated mostly at the main lava channel channel near the south end of the lava delta, but some fans out along a 1km stretch. Today’s collapse explosion went off at 4:12pm, M5.3, partly hidden on the livestream by a dust cloud from rockfalls 4 minutes earlier. 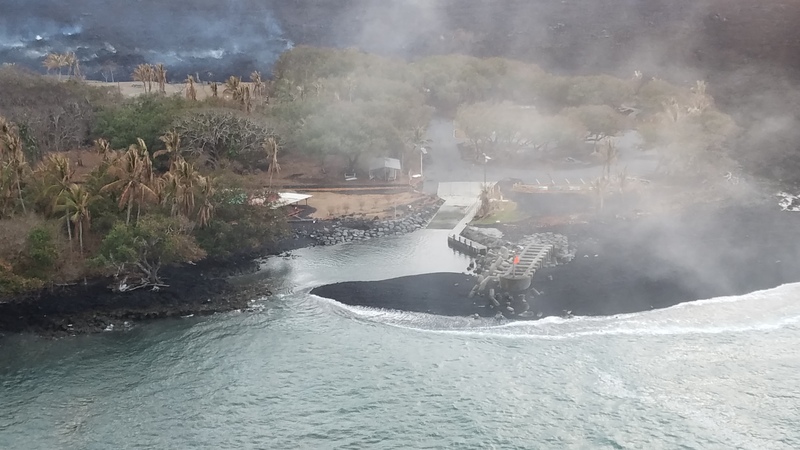 Just as yesterday, I noticed the “collapse explosion” started with a visible camera shake, unlike earlier rockfalls that made me think, “Waaaaait— was that it?” The explosion itself didn’t send up much dust past the rim of Halema’uma’u. About a minute later, dust from caldera wall rockfalls (I think?) blew past. Below: Rockfalls, dust cloud, then I fast forwarded to the collapse explosion. 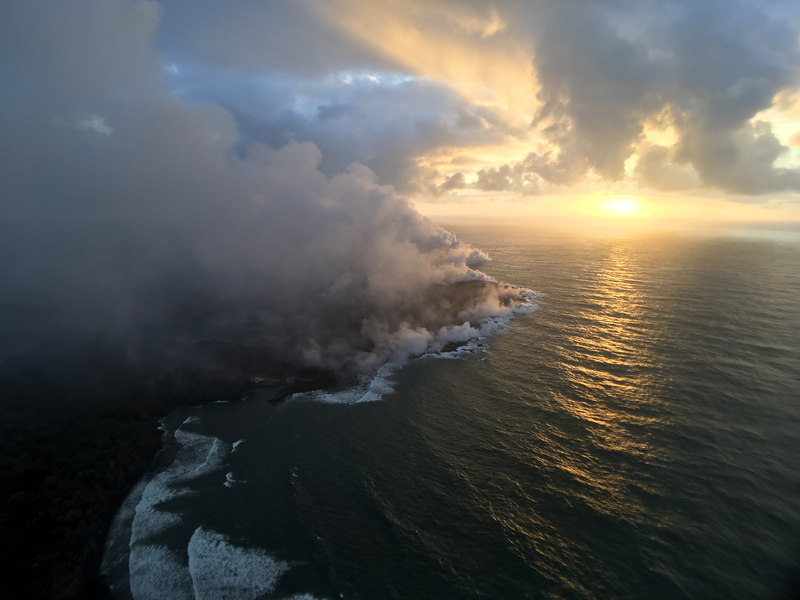 Today’s USGS Kilauea update gave additional details for yesterday’s explosion which probably apply to today’s as well: “Seismicity dropped abruptly from a high of 25-30 earthquakes per hour (many in the magnitude 2-3 range) prior to the collapse explosion down to 10 or less earthquakes per hour afterwards. Within 4 hours seismicity began to creep up again averaging about 25 earthquakes per hour by daybreak (June 24)” i.e. about 14 hours later. Hawaii 24/7 puts out weekly timelapse videos collecting all the screencaps from the USGS/HVO webcams. 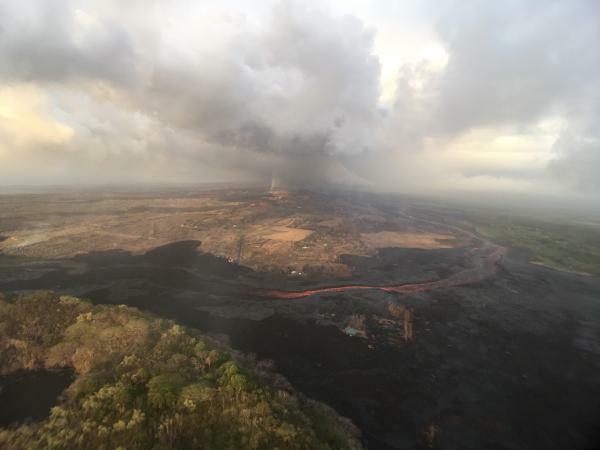 Fissure 8 continues as usual, sending its lava river down to the ocean at Kapoho, with a “dominant ocean entry on the south edge of the flow front…producing a large laze plume.” Minor, brief overflows upstream aren’t traveling past previous lava flows. Fissure 6 is inactive; 16 incandescent; 22 woke up and was fountaining weakly during the USGS morning overflight. 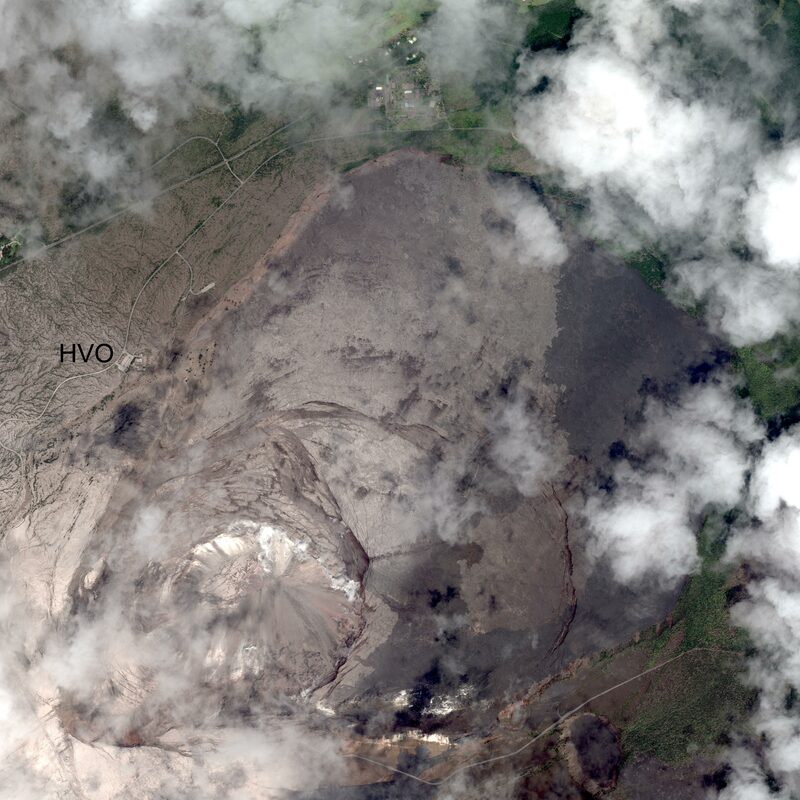 Seismicity at the summit was “elevated overnight” according to today’s only HVO status update at 8:45 am. There appeared to be a lot of rockfalls/isolated slippages on the livestream today, especially on the left rim, but the really-truly “collapse explosion” (as USGS is now calling them) occurred at 6:52pm, 5.3 energy equivalent, 500 foot ash plume. 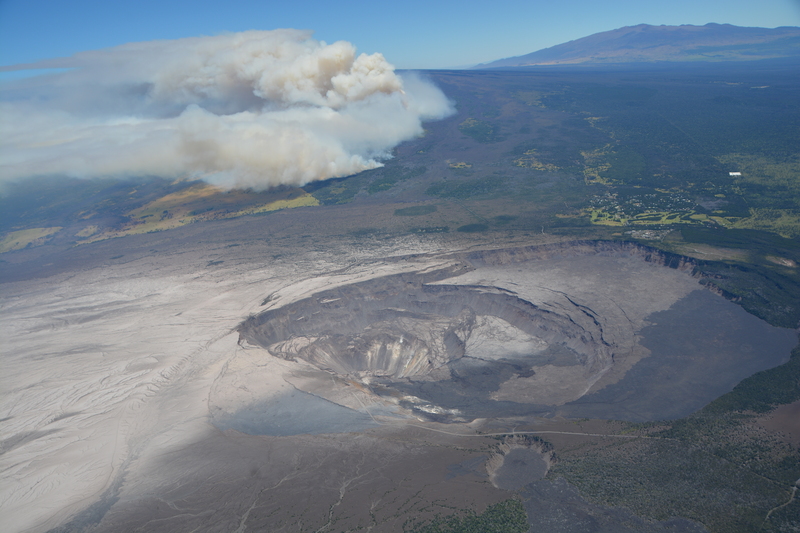 Here’s my transcription of the June 21, 11AM USGS media conference call. Update: Status quo at Fissure 8, LERZ, Summit. 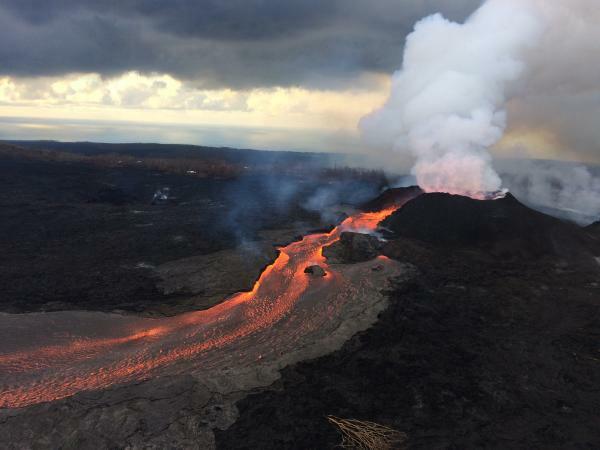 New “tidbit”: front of lava is sitting on ocean floor that was 60 meters deep. Also, using term “collapse explosion” for daily explosions, because not 100% clear whether explosion triggers collapse or vice versa. Tradewinds and showers through weekend. 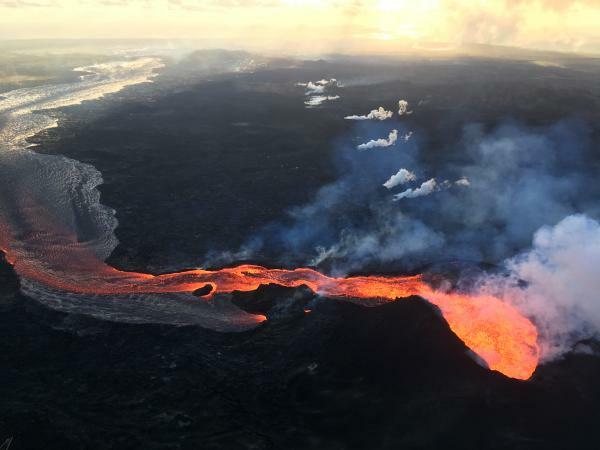 Q: Trump administration tightening rules on USGS speaking to reporters; will that impact our communications? Leslie Gordon, USGS Public Affairs: That will not affect what we’re doing here at Kilauea. I think the department realizes that this is an urgent situation. We have people’s livelihoods endangered. People have lost their homes and businesses. 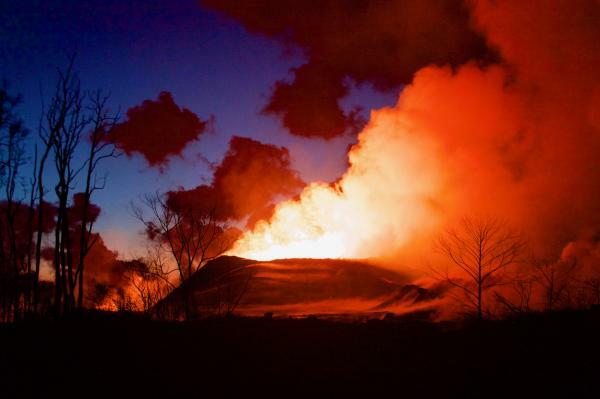 And so we— it will not affect what we’re doing here regarding Kilauea Volcano. 3. 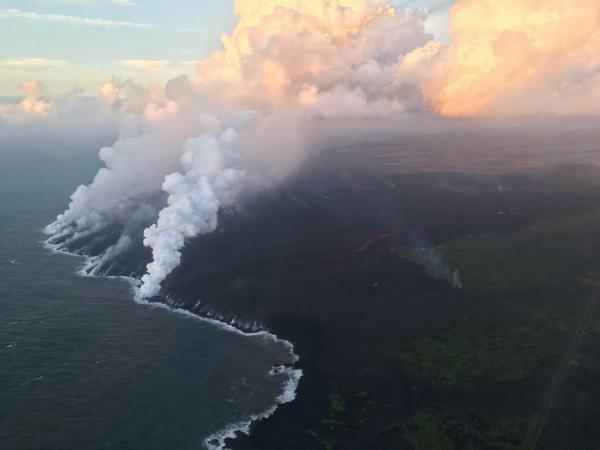 Q: Do you think it’s safe local residents to view lava if they’re outside mandatory evacuation zone? A: Not our call. It’s up to Hawaii County. 4. Q: What’s process for naming fissure 8? A: Hawaiian elders, community, Board on Geographic Names decide when and what to call places in Hawaii.